One of two buildings remaining in the Brookfield and Wesleyville area that can be traced to the famous Kean family, Kean's General Store is a landmark in the area. Although the store is an excellent example of a typical 19th century commercial property in Newfoundland, there are also some decorative features that indicate creativity on the part of the architect. These include decorative mouldings and a 6-sided corner bay with a domed roof. 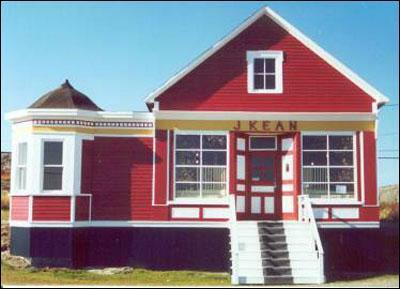 As a sealing family, the Keans are one of the most famous in Newfoundland. Captain Job Kean and his wife, Virtue Hann, constructed the store circa 1890. Kean was an active businessman in the community, owning eight vessels, mastering several of his ships to the ice during the seal hunt in the spring or to the coast of Labrador to fish for cod in the summer. Kean's General Store was a centre for commerce in the Brookfield area. Because it was located near the harbour front, Kean's ships had easy access to the store when they arrived in port with supplies and merchandise. Kean also supplied other sailing vessels in the area and operated a telegraph and post office on the premises. As successful as Job Kean was, he was never as famous or infamous as his uncle, Captain Abram Kean, the most successful sealing captain in Newfoundland history, who took more than 1,000,000 seal pelts during his career. The Kean's business influence gradually waned. The store remained in the family, passing from Job to his son Baxter, who died a bachelor and passed the business onto his nephew, Captain Job Kean (who was named after his grandfather) and his brother. The store finally closed in the late 1970s and fell into a state of disrepair. The store has a unique style with a stunning view of the surrounding area. Made of wood, with a long slanting roof, it is adjoined to a flat-roofed portion that houses the office. It has recently been repainted and major repairs have been made to the rest of the building. It became a Registered Heritage Structure in June 1988. Also view the Kean's General Store Registered Heritage Structure on the Heritage Foundation of Newfoundland and Labrador web site. The Newfoundland and Labrador Heritage Web Site has on its site only a portion of the registered heritage structures in Newfoundland and Labrador. To view a complete list or search for a particular structure visit the Heritage Foundation's Property Search page.